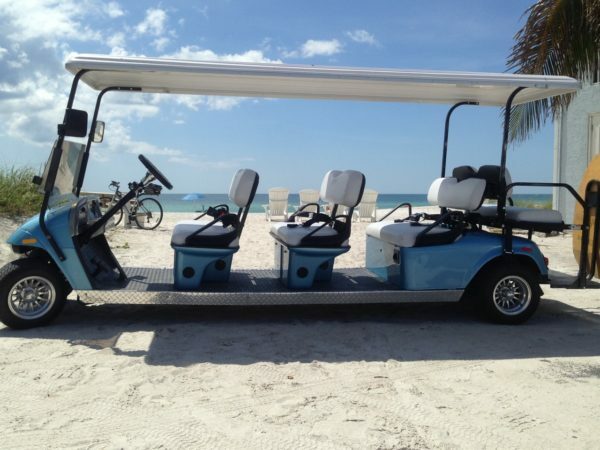 Our biggest and most luxurious golf cart rental. The 8 passengers carts are the limos of golf carts. There is enough room for the whole family to enjoy cruising the island. Try something new! Carts are excellent for daily travels or going out on a simple dinner date. Golf carts are easy to drive and if there are any questions our customer service team is here to help. Please note all drivers have to be over the age of 25 with a valid driver’s license. Please Call in and Check for Availability before ordering online. Small but mighty! This cart can hold up to 4 people and have you and your family see the island from a whole new view point. This cart has room for your family and all their beach supplies! Take a ride to dinner or browse the local shops. Our vehicles can get you around the island in style.